Manufacturer of a wide range of products which include grinding pump, stainless steel horizontal multi stage pump, vertical multistage pump and rotary lobe pumps. We are offering Grinding Pump can be used wherever it is essential that solid matter in fluids be broken down reliably to ensure the prevention of pipe clogging and damage to downstream equipment. This low-maintenance assembly is designed for sludges with a maximum flow of 300 m3/h and a dry matter content of up to 7%.Allowable solid content for wastewater 2 – 7% and for biogas up to 12%. The special design of the housing carries the solids to the cutting plate, where they are held, chopped and ground by rotating blades. The M-Ovas: use it to dependably prevent the clogging of pipes and downstream equipment. Stainless Steel Horizontal Multi Stage Pump. We offer good quality stainless steel horizontal multi stage pumps, multistage pumps, horizontal pumps in different range and features. 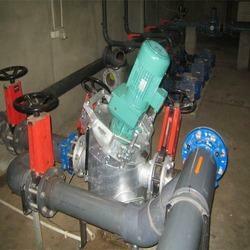 We offer wide range of Vertical Multistage Pump. The hydraulic model and advanced technique enhance the performance to a large extent, and the service life is also prolonged. The overflowing part is produced by stamping and welding the stainless steel plate, so light corrosive liquid is suitable for this machine. Meanwhile, the mechanical seal is made of hard alloy and fluororubber, thus the reliable operation is guaranteed, and the liquid with high temperature is also applicable. 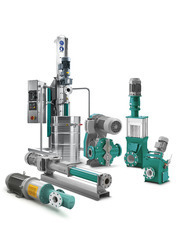 NETZSCH Pumpsand Systems are the Leading manufacturer of Positive Displacement Pumps. The Positive Displacement Pump principle is ideal for handling slurries, viscous, shear sensitive or two/tri phase mixtures or when applications require, significant suction lift capabilities. The pump design is ideally suited for both low to high flow applications and also allows for the development of multi-stage pumps that increase the pressure handling capabilities. The heart of the NETZSCH pumps are the rotor and stator. As the single helical rotor revolves eccentrically within the double helix of the stator, a continuous cavity is formed and progresses towards the discharge end of the pump as the rotor rotates.